The first track we co-wrote with Marvin was called “Where’s My Love Gone”. 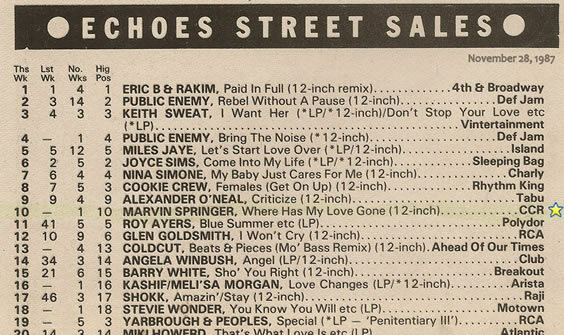 Written & recorded at the Garage, the track was later re-mixed with Froggy at Maison Rouge & then released on Froggy’s label, Circle City Records, reaching #15 in the Radio London dance charts & #10 in the Echoes Street Sales Chart (pictured). We went on to record over a dozen tunes with Marvin all of which are listed below. We have also salvaged a couple of radio plays from Radio London back in the day. Marvin & Richard later produced the Still Searchin’ remix of Where’s My Love Gone in 1992, released again on Circle City Records. I’m trying to track down Marvin Springer who I lost touch with a few years ago! I was wondering if you could tell me where he is/how I can get in touch with him. If you can help me, I would be very grateful! Hi Jools. I too have lost touch with Marvin sorry I can’t help. Very talented guy, hope he’s well. Sorry for very late reply but have been abriadvfir awhile! What a pity you’ve also lost touch with Marvin too. As you say, a very talented chap! If you ever hear from him, please wouldyou be kind enough to let me know – thank you!